During your next craft time, strike up the band with this homemade instrument, a Chinese hand drum that will help your kid learn the basics of music and also introduce him to culture and world history. Start with a little research: The Chinese hand drum, also called a rattle drum, originated in ancient China around 475-221 B.C. 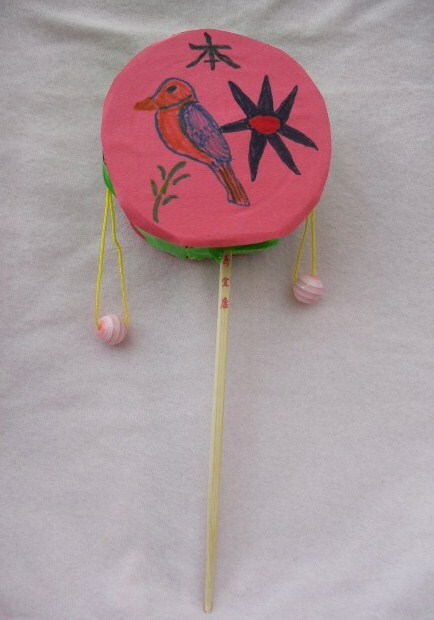 During the Song Dynasty (960-1276) the drum became a popular children’s toy, as it is today in modern China. Two small balls attached to the sides beat the hollow drum. Its surface is sometimes painted. Give your child the round object for the drum. Help him cut two construction paper circles to match the drum’s two side surfaces. Your child can glue a circle to each drum side. After the glue has dried, use scissors to help your child poke a hole in the bottom of the drum, where a chopstick can be inserted as the drum’s holder. 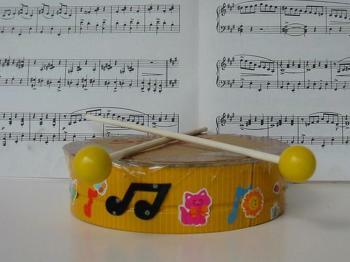 Let your child cut strips of colorful duct tape to put around the drum’s edges. Tape will hold the plastic or cardboard lid onto the drum base, and also go around the chopstick to keep it attached. Cut the string in half. Put a 10-inch string through a bead or bell. Fold the string in half (now 5 inches) and tie a knot. Have your child insert the knot and string ends under the side duct tape of the drum. Add more duct tape to attach the string. Repeat step #6 for the other 10 inches of string and bead or bell on the drum’s other side. Let your child use markers to draw Chinese designs (e.g. flowers, a dragon, tiger, panda or birds) on the drum’s surface if he desires. Have him twirl and twist the drum: the beads banging on the surface will make music! Shed some "light" on the Chinese culture while brightening up your home. 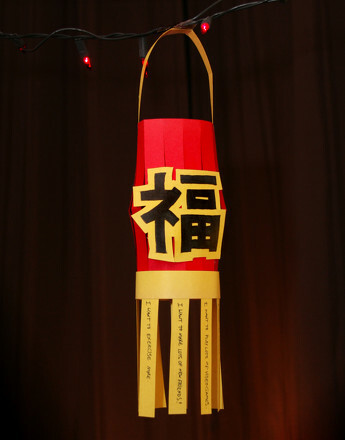 Teach your child the Chinese character for good luck with this lantern craft.